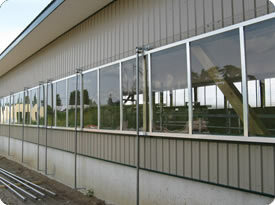 Continuous sidewall windows made to fit any length. 12” to 6’ in height. Stainless steel cable systems and pulleys with bearings to ensure long life. Nova-Lite Vu panels typically drop to open but an option to pull up to open is available. Perimeter gasket system and adjustable brackets to ensure a good seal between panel & structure. Sun-North Systems Ltd. manufactures and installs Nova-Lite Vu sliding crystal clear acrylic glass panels in a wide range of sizes. 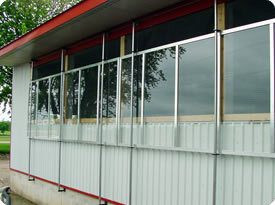 The panels are virtually unbreakable and allow full light penetration. Nova-Lite Vu offers a variable ventilation opening with an all aluminum heavy duty window frame assembly. 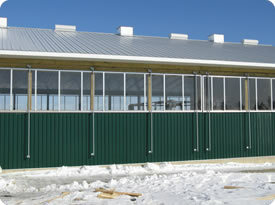 Our clients find it the best panels for their tie stall barns, milking parlours and equine areas.